On December 3, 2011 a group of nine Snomads drove up to Deckerville in Michigan’s thumb to help our closest neighboring club, the Thumbs Up Snowmobile Club sign and mark their trails. 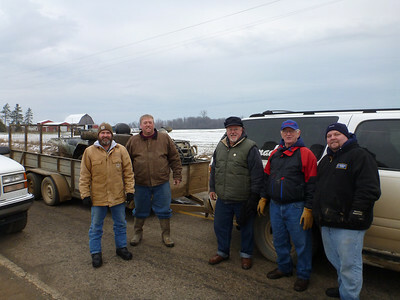 Chuck Comstock, Ray Williams, Merle Fitch and Matt Baxter met up in Clarkston. Another group consisting of John Newman, Tim Featherston, Dwight Wiseman, Marty Foster, and Al Cumpf, met up in Lenox Twp with a pair of clean and shiny ATV’s in tow. We traveled almost 2 Hrs to get to Wilson Park in Deckerville and were welcomed by Tom Sokol, The TUSC trail coordinator, a group of members and their assistants from the Sanilac County Sheriffs Work Program. We divided a total of 22 people into 4 groups and were ready to head out into the snow and mud. After a short meeting to lay out the days activities we gathered up a pile of various signs, a bunch of posts and a few tools and headed north with our guide Ed Gosdzinski. Chuck, Ray, Merle, Ed and myself focused on singing trail 20 from the towns of Ruth to Palms. 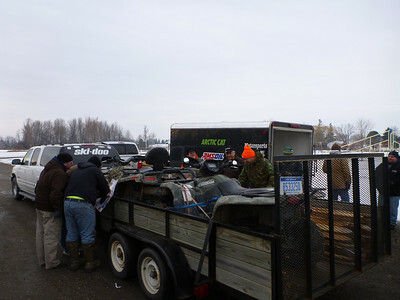 Johns team of Dwight, Al and Marty took the ATVs and focued on trail 21. Im not sure if Ed realized it or not but nobody in our group had ever signed trails. When we made our first stop at the grain elevator in Ruth we realized that the various saws, and brush cutting tools in truck were of no use. We quickly realized that all we really needed was a drill driver and a bucket of screws and a good pair of boots. Since our group didnt have an ATV we focused on road crossings. We quickly got a system going. 2-3 of us would do one side of the road and the other would do the opposite side. Sounds easy enough, until you have to walk 350 ft out in to the muddy farm field to set the stop ahead sign. 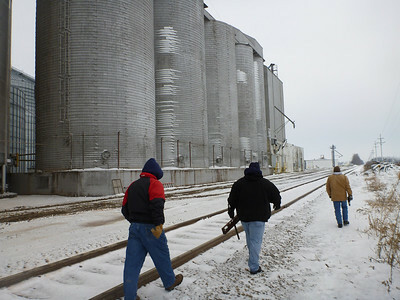 Being the tallest of the group, I got the job of counting out about 120 strides to set the sign properly while Chuck and Merle stood on the side of the road chuckling as I try to make my way out there the freshly plowed, wet snowy field. At around 1 PM we decided to meet up with the other groups at The Firehouse Pizzeria and Grill in Minden City. They are located 1 block west of the trail crossing in downtown. Our group arrived first, and soon after we filled every table in the restaurant. We had a fantastic lunch of sandwiches and Pizza. Sue Messing the owner of The Firehouse graciously discounted our meals and also made a cash donation to the Thumbs Up Club and mentioned that with an advance phone call she would open early or close late to accomodate us if we’re out on the trails for the day. Its really great to see local businesses partnering with the local club for the betterment of the snowmobiling community as a whole. These are the relationships that keep trail opened and locals tolerant of our evening treks through their town. Tolerant with the exception of these two hoodlums. After lunch we continued on and signed more trails to the town of Palms. 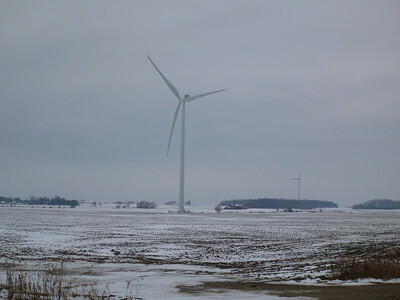 Have you ever noticed all the long trucks in the highway with wind turbine blades and wondered where they were going? 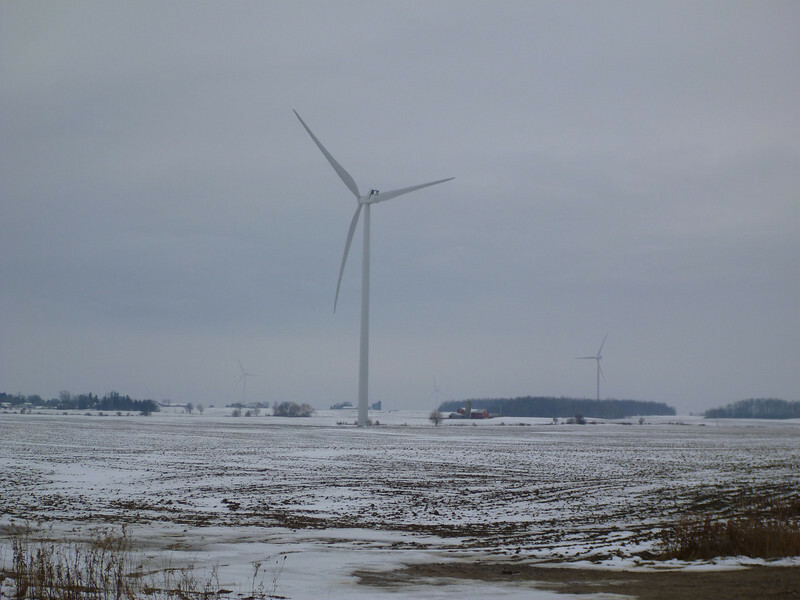 I would bet that most were headed to Sanilac County. Ed told us that they were installing 50 of them around the area and we saw them all over the place. Im told that the land owners are paid hansomly to have one placed on their property. About 4 PM John Newman and team came upon us near Palms and it was a good thing because we had just run out of Stop signs. Remember those clean ATV’s I mentioned? Not so much anymore. After the local farmers harvest their crops they chisel plow the fields and douse them with a generous helping of “Black Gold”. We saw and smelled our share of tractors with that immediately recognizable cart. Lets just say we saw our share of flying mud falcons, many of which were now all over both ATV’s. We stopped for a photo in the middle of the road and then continued on. We finished up for the day and headed back towards Deckerville to start our trip home. We just pulled into town when John called and said they had a flat on the trailer. We headed for Wilson Park to provide assistance. By now it had started to rain and we unloaded all the signs and posts and prepared to head home. Chuck had a bottle of fix a flat for John. They put it on the tire and we all headed out. It was a great day. We had a lot of fun, met some great people and went home tired. Now….All we need is a couple feet of snow to head out and enjoy our hard work. 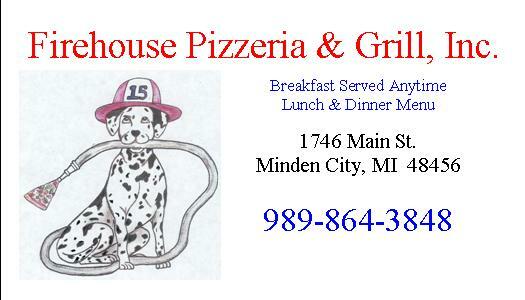 When you do, be sure to have lunch at The Firehouse Grill in Minden City, MI.